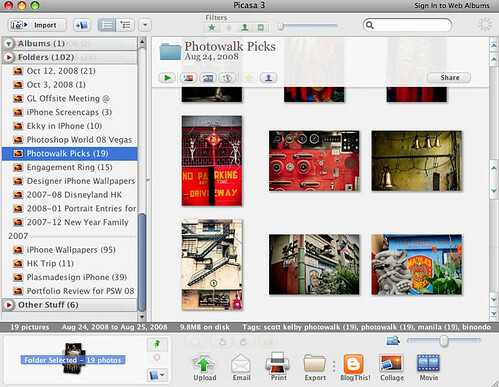 Google just recently released the Picasa 3 Beta for Mac. For those who are users of Picasa for Windows, this is a good addition to the available photo applications for Mac users. Running it for the first time is a breeze. It asked me if I wanted to have my whole computer scanned for all images. Unfortunately, there was no cancel button here. I was surprised at how fast it took to scan all my photos — it went through my whole iPhoto library and the other Photos that I have. I think I might have canceled it in the middle because it wasn’t able to see my Lightroom Photos. Since I’m already a Lightroom user, I was thinking of a way for me to maximize this tool. I’m not really looking for a new app to replace Lightroom, so I thought it would be good to find out the ‘extras’ that it offers. One of the things that caught my attention was the ‘Collage’ option and the polaroid settings. I don’t know why, but for some reason, I like the look of polaroids as a template when presenting photos now. So, that’s just what I did. The great thing about the interface is that you can just click the ‘Scramble Collage’ button and it automatically re-arranges the photos that you have there. Pretty simple. You can also adjust how big the photo is displayed and you can then move them manually. The thing that I would have wanted though is to have the flexibility to adjust what part of the photo you want displayed. 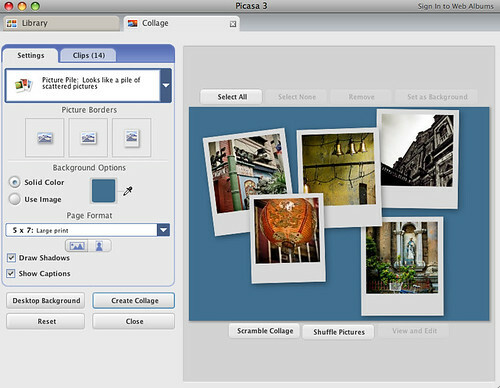 Once you’re done arranging, just click the ‘create collage’ button and then you can export the collage as a jpeg file. Here’s a bug (hopefully, it’s a bug not just a glitch on my machine) that I saw. 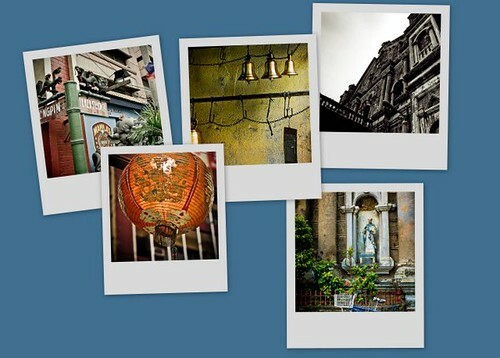 When you export a collage (or any photo), there’s an option to add a watermark. I tried both options — with and without a watermark. To my surprise, the watermarked version of the image is corrupted. I opened it in the Flickr Uploader Tool and Photoshop and they both said the file was corrupted. Photoshop was still able to open it but you can see that the bottom part isn’t rendered properly. Check out the photos below so you can see the differences. I like the output of the collage. It gives me an easy-to-use layout to show my work, especially when showcasing some photos in this blog. It saves you me a lot of time instead of going to Photoshop to achieve this. Overall, it’s still a great app. I don’t think I will use this over Lightroom but this gives me more flexibility in quickly editing photos without having to organize them in a catalog because it just reads the photos in their current location. If I need to quickly put in a layout or to quickly go through all the images in my machine, this fits the bill. To download Picasa, go to Google’s Picasa Site. Also, don’t forget to read the additional support info for Mac Users. World’s Thinnest Notebook – Macbook Air! 230am – Steve Jobs just announced the Macbook Air in his keynote at the MacWorld 2008. Wow! It is incredibly thin…it even fits in an envelope!!! I’m sure pictures of the new laptop will come out soon on Apple’s website. Because I’ve been thinking of upgrading my Powerbook to the newer models, I am not sure if I will get this new laptop mainly because I still need the processing power of the Macbook Pro. However, the new Macbook Air would be a great machine to have on the road. Hmmm…if only I have the budget.